Fungicides are grouped by ‘families’ or ‘classes’ that share a common mode of action and chemical structure. The Mode of Action Group (A, B, etc.) refers to the biochemical process inhibited by the fungicide, such as cell wall synthesis, respiration, etc. Sub-groups (A1, A2, etc.) within a Mode of Action Group refer to specific biochemical target sites of action. A Group Name (e.g., Carboxylic acid, Benzamides) is given to each sub-group. A group will contain various fungicides that are known by their common name. The Common Name is printed in the Ingredients Statement of the fungicide label. 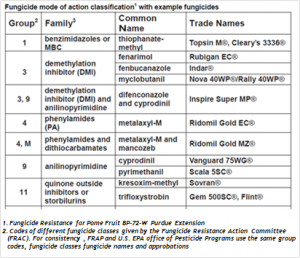 The Fungicide Resistance Action Committee (FRAC) developed a code of numbers and letters that can be used to distinguish the different fungicide groups based on their mode of action. This code is known as the FRAC Code, and is now included on fungicide labels. FRAC Codes are organized by numbers and letters (currently 45 numbered groups and 3 letter groups). The numbers were assigned primarily according to the time of product introduction to the market. The letters refer to P=host plant defense inducers; M=multi-site fungicides; and, U=unknown mode of action and unknown resistance risk. Reclassification of compounds based on new research may result in letter codes to expire. This is most likely in the U-section when the mode of actions get clarified. For the complete list of FRAC Codes sorted by fungicide mode of action, go to www.frac.info, select ‘publications’ in the list on the left of the page, and click on ‘FRAC Code List’ (the resistance risk for each fungicide group is in the ‘comments’ column). There is also a ‘FRAC List of Fungicide Common Names‘ in the publications section of the FRAC website. If a fungicide contains more than one active ingredient (pre-mix), both FRAC Codes will be listed in the FRAC Code box (see example on right). If FRAC codes are not found on the front of the label, they can be found within the resistance management section of the label. Fungicides with the same FRAC Code have similar mode of action and therefore could exhibit cross resistance. Thus it is critically important to know the group code for the fungicides being used for a particular disease to avoid alternating among chemically similar fungicides. In the absence of other alternatives, it may be possible to rotate fungicides between subgroups (e.g., D1 and D2) if it is clear that cross resistance mechanisms do not exist in the target populations. Consult local expertise or visit www.frac.info for more information. Fungicide Spraying by the Numbers — Fungicides with similar modes of action could exhibit cross resistance. One way to avoid this is by rotating chemically dissimilar fungicides.